This test measures antioxidant additive levels present in lubricants. Linear sweep voltammetry, more commonly referred to as the Remaining Useful Life Evaluation Routine (RULER) test, measures hindered phenolic and aromatic amine antioxidant content. This test quantitatively analyzes the relative concentrations of antioxidants in new and used oils in order to monitor the depletion rates of the antioxidant protection package in the oil. Hindered phenols and aromatic amines are primary antioxidants used in many industrial oil and zinc-free turbine oil applications. 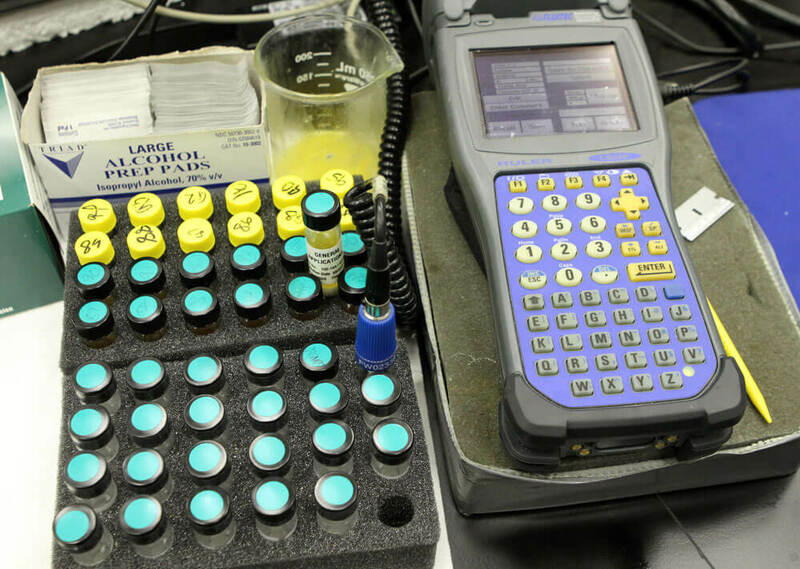 By measuring the depletion and available reactivity of these antioxidant compounds while conducting other routine performance tests, the service life of used lubricants can be effectively monitored. Antioxidant additives are added to an oil to protect the oil from oxidation. These antioxidant molecules protect the oil by reacting with and neutralizing free radical molecules which would otherwise attack and damage the base oil. The RULER test uses linear sweep voltammetry technology to detect antioxidant additives. Antioxidants are extracted from the oil sample into a special solution. The instrument passes a current through the prepared sample, increasing the voltage over a set timeframe. Antioxidants will accept electrons at certain voltages, producing a peak on the RULER graph. The areas of the peaks produced by the in-use fluid are compared to the areas of the peaks produced by new oil to calculate the percent remaining antioxidants. The level of antioxidants present in the lubricating oil gives an indication of the ability of the fluid to resist oxidation. Regular monitoring allows the rate of depletion to be observed, and can be useful in determining remaining useful life so that informed decisions can be made regarding oil changes. This test is useful in monitoring the oxidative health and remaining useful life of lubricants with an antioxidant additive package, such as turbine oils, some hydraulic fluids and some engine oils.